Hey Folks, I've been gone a while due to family and work taking over my life, but I've still been tinkering with my Evo. 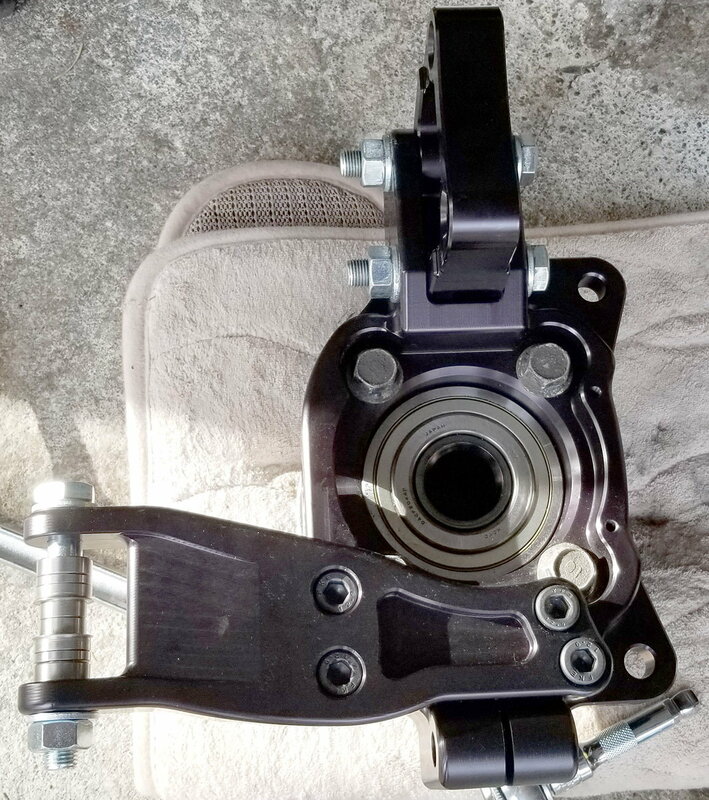 My latest update has been to install a set of the new SSB Designs front roll center correction knuckles with the 1.25 inch offset attachment for the control arms. 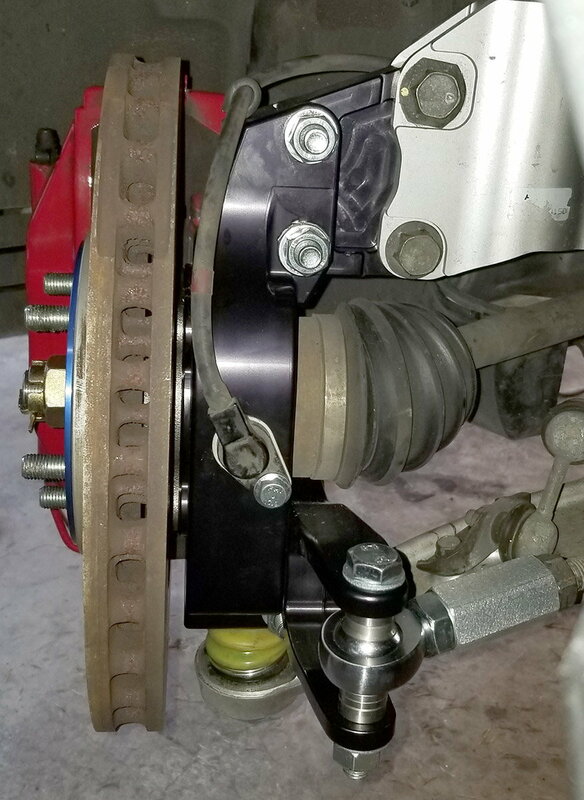 I think most of you know that the front roll center and roll moment are especially adversely affected when lowering a MacPherson strut suspension such as what is used at the front of the Evo. The Whiteline RCK is a step in the right direction towards fixing the issue, but its ~5 mm offset provides very little correction to the control arm position. 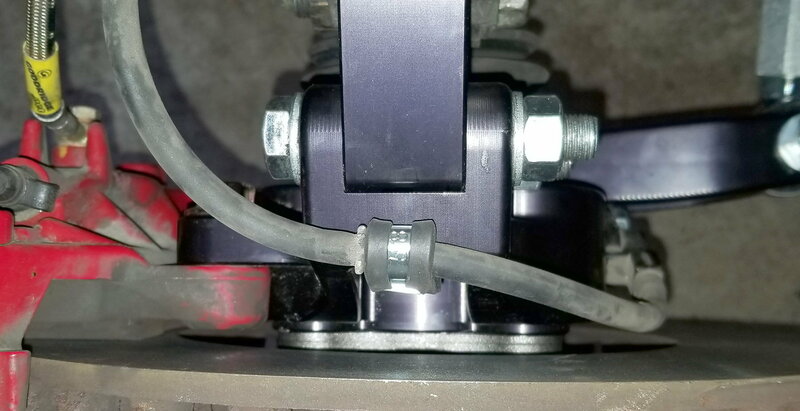 The issue with attempting to fix with a ball joint is that only so much offset is possible before the stresses on the ball joint shaft become too high. 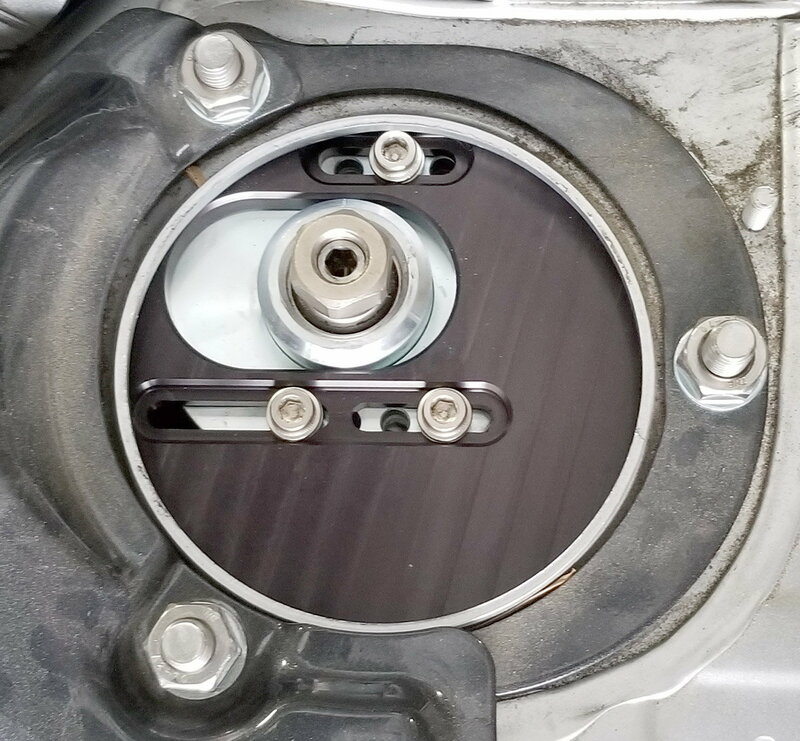 The only way to provide a truly meaningful correction to the control arm position is to make a new knuckle that substantially drops the mounting location to the steering knuckle. Thankfully for the Evo community, we have DallasJ who is not only a talented auto-x'er, but also has mechanical engineering and machining skills. Again as many of you probably already know, he already has a custom knuckle available that provides a 2 inch correction to the control arm mounting location. This is great for very serious track and AX cars, but for people who don't want to lower their Evo more than 1.5", its a little too much correction. I had talked with Dallas several times about about those knuckles, and at some point, I suggested that maybe a version with a bit less correction might be a worthwhile pursuit. I suspect that he had already been thinking about it, because he decided rather quickly that he would make me a set with a 1.25" correction. Fast forward to the present, I received my pair about a week ago, and I finished the install this weekend. I talked with Dallas many times about the durability and features as he was designing them, and I was impressed with everything I learned. The final product is no less impressive. 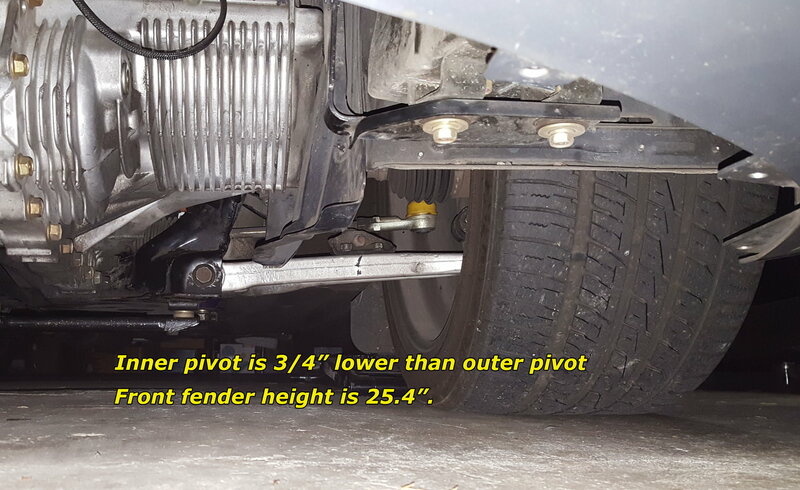 I'm sure he'll have better photos than mine soon, but see below for a few snap shots of the install process and control arm angle at ride height after installation. The knuckles fit perfectly, and all the needed hardware was included. Everything is top quality and made to last - all the aluminum parts are black anodized, and the hardware is either zinc coated or black oxide coated for corrosion resistance. (Wheel bearings are not included. Since I was digging that far into the suspension, I decided to go with a new set.) As can be seen, the steering arm connection to the knuckles utilizes a heim joint rather than the factory ball joint. This was needed to allow for an adjustable attachment height to compensate for added caster. The factory disk brake heat shield doesn't fit, but Dallas is working on a brake duct solution. I haven't had a chance to drive it yet. In talking with Dallas, fixing the front roll center causes the front suspension to take more of the cornering load, and will likely result in increased push without any other changes to the suspension despite the more favorable camber evolution as the suspension compresses. I'll likely have to add some additional spring rate at the rear to compensate. I'll report back some time on Monday after I've had my Evo in for an alignment. 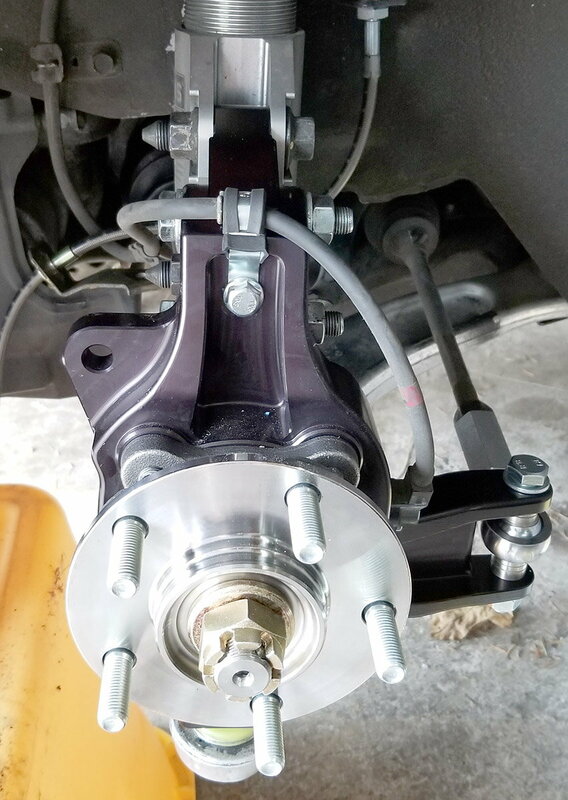 Control arm angle after install with car at ride height. Perfect angle. Control arm angle before SSB Designs knuckles. An SSB Designs camber plate that found its way on my Evo. Adds about 1.5 deg of caster. Last edited by mrfred; Apr 2, 2018 at 01:06 PM. Interesting! Can't wait to see how these work out at the track! Nimpoc has already tracked a set. Maybe he'll chime in. And there are a bunch of the 2 inch correction version on Evos. I just don't know whose. Seems everytime someone gets a set I learn just a little bit more. So of course 2nd is better than 1st, and 3rd is better than 2nd.. Etc. But always love getting feed back on how to improve things further. What wheel/tire size are you using? What does your ride height measure at? These are right on the money for their intent. Besides the additional threaded hole that we discussed for better placement of the ABS sensor line, these are everything that I need. In my few chances today to rip some corners, I was truly impressed with the difference in feel. Gone is the tipping feeling during cornering at the limit, and in its place the car squats and digs into the corners, especially under power. Its a much much better feel. Last edited by mrfred; Apr 2, 2018 at 09:17 PM. Gone is the tipping feeling during cornering at the limit, and in its place the car squats and digs into the corners, especially under power. How much is your 10 lowered? I think you mean that they will also work with Evo Xs since the components are similar between both cars. Or am I mistaken? It would be cool if these uprights could be used with different brake calipers. Maybe a dual option for radial and traditional mounting styles. 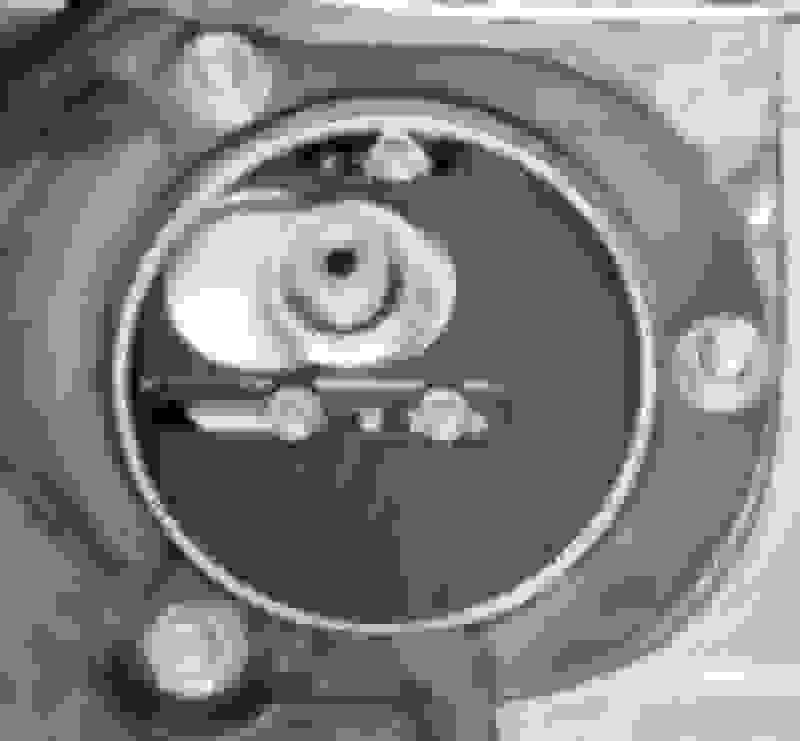 I have to change the ABS mounting, add a spacer for the ABS, and open the holes of the brake mounts 2mm. Right now I have 1 nearly finished set I can make to an 8/9 or X that Im just waiting for someone to claim. I may just go ahead and make it an X part though since I have a couple 8/9 sets. 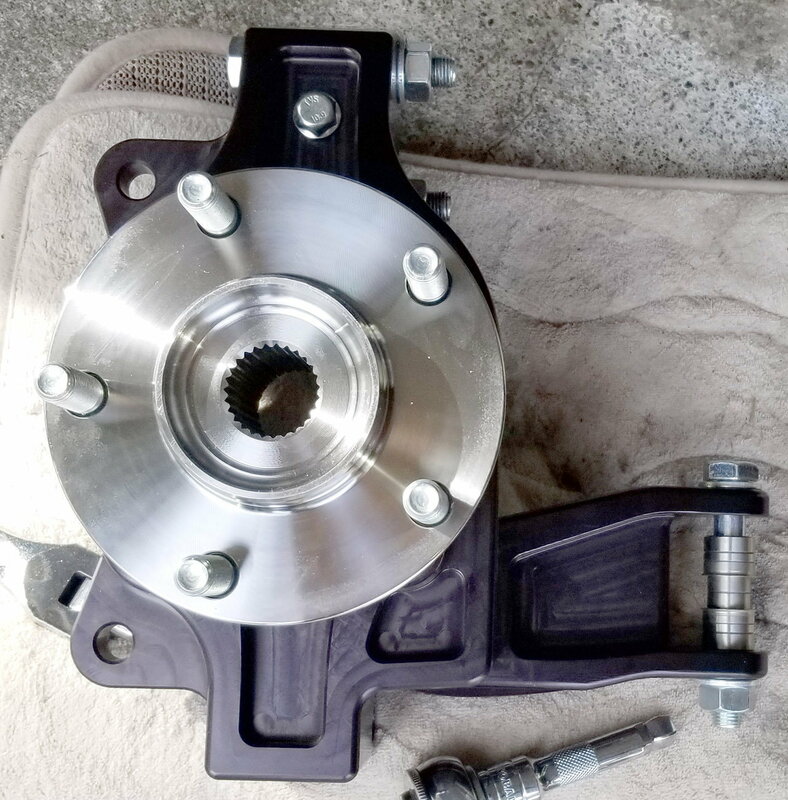 For the brake options, I asked a few times for ideas on what would be used or can fit with OEM or upgraded rotors to do a radial mount version but havent gotten anything yet. I would love to find something ultra lightweight to replace the brembos without giving up much performance. That would be worth it to me to make a couple special sets, I just need to know what caliper is appropriate. Honestly I'm not sure, not crazy. I also have no roll center correction yet. Get a pair. If your Evo is only lowered 3/4" or something like that, these will allow you to go lower to further reduce CG while still having a favorable RC and camber correction.